Oral arguments in the civil suit filed by Formosa Plastics Group (FPG) affiliates, the Formosa Chemicals & Fiber Corporation and Mailiao Power Corporation, against Professor TSUANG Ben-jei of National Chung Hsing University will be held at courtroom 25 of the Taipei District Court on 3:00 PM, August 29, 2013. In what is widely regarded as a strategic lawsuit against public participation (SLAPP), the environmental engineering professor is accused of harming the reputation of the companies by raising questions in his research studies as to FPG’s data on the flue emissions at its sixth naphtha cracker facility in Mailiao, central Taiwan, and pointing out correlations between emissions and increased cancer rates among residents in the area. The plaintiffs are asking for forty million New Taiwan Dollars in damages (approximately US$1.3 million) and a public apology statement in four major newspapers. In the six hearings since the case was filed in the spring of 2012, the court has focused on the plaintiffs’ meeting their burden of proof to prove the professor’s statements false by producing data on emissions from the project’s 387 flue chimneys. To date, the request has not been met, leading the commissioned judge to remark that this failure could affect the outcome of the case. 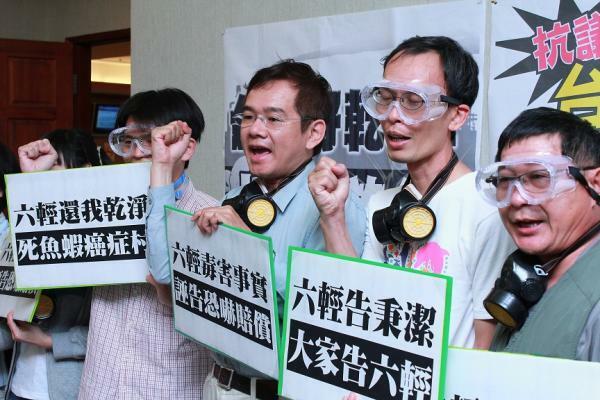 Meanwhile, the defendant’s legal team has questioned the plaintiffs’ standing because Professor Tsuang’s research and statements are directed at the entire Mailiao operation, a facility that includes more than a dozen corporations under the flag of the Formosa Plastics Group. The lawyers have also pointed out that if the substantive claims are addressed, the constitutional protections for freedom of expression will be undermined. The three-judge panel will hear final arguments on August 29 before adjourning to make their decision. The two civil plaintiffs have also been waging an attack against the professor through criminal complaints of aggravated defamation. Although the Taipei District Prosecutors Office have twice rejected the criminal charges on the grounds, inter alia, that Tsuang’s statements were “fair comments on a fact subject to public criticism” and thus constitutionally protected, the Taiwan High Prosecutors Office remanded the case to the Taipei District Prosecutors Office where the case is pending. The first hearing had been held on June 25, 2013. Speaking on behalf of the defendant and his legal team, Thomas Chan of Primordial Law Firm stated that the sole purpose of these civil and criminal suits is to stifle criticism from academics. This “chilling” strategy appears to be effective, as most scholars dared not speak out on behalf of the residents and the environment during subsequent hearings held in conjunction with the environmental impact assessment proceedings for FPG's expansion plans for its sixth naphtha cracking plant. Chan pointed out that the FPG syndicate has sufficient resources to conduct their own research to rebut any unfavorable study or to reveal their emission data to support allegations of false statements. However, he continued, “FPG chooses to harass and torture a person they deem as an ‘academic trouble maker’ through these legal actions.” Chan and the whole legal team have urged the court to uphold the freedom of speech, a fundamental of democracy, and to withstand FPG’s efforts to stifle comments on development projects, particularly when such projects are so heavily reliant on the tax revenues collected from the very public whose voices FPG seeks to silence.